The Alaskans – western TV show. Silky Harris and Reno McKee have arrived in this town looking to make their fortunes. Not mining for gold, but by catering to and fleecing the hardy, hard-living miners who pass through town. Written by Jean-Marc Rocher. CLICK ON THE PHOTO TO GO TO The Alaskans TV show to Watch Free Online VIDEOS. 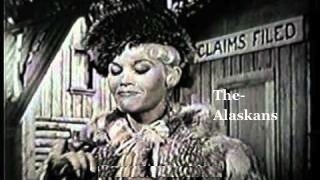 This entry was posted in The Alaskans – western TV show, Western TV Shows Full Length and Free to Watch Online and tagged complete, Dorothy Provine, free, full length, Jeff York, online, Roger Moore, series, shows, The Alaskans, TV, watch, western, western TV show, westerns. Bookmark the permalink.